Cambridge University Press, 9781107177512, 200pp. 'Democracy in India is only a top-dressing on an Indian soil, which is essentially undemocratic', warned Bhimrao Ambedkar, the principal architect of the country's constitution, a year into independence. The social order - the soil on which India's new democratic edifice was then being erected - was marked by social hierarchies and economic vulnerabilities. Decades of socio-economic changes since then would transform this old order, albeit unevenly across Indian states, to decisively shape the development of democracy in the country. Why Democracy Deepens relates how these socio-economic changes have deepened democracy in India beyond its topsoil. 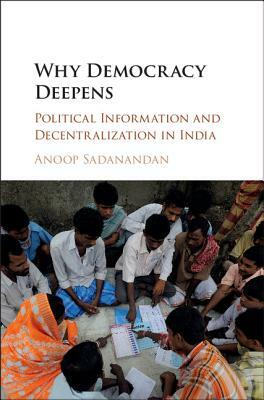 Drawing on his research in villages and states, Anoop Sadanandan explains how socio-economic changes have heightened the need for local voter information, and have promoted grassroots democracy in some Indian states. By exploring the pivotal political developments in the world's largest democracy, the book puts forward a theory of local democratization.